Ingleside, Texas - Maria J. Rivera passed away peacefully March 29, 2019 at the age of 87. Maria was born in El Salvador on February 7, 1932 to Desideria (Diaz) and Humberto Taura. 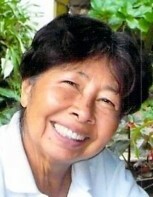 She was a resident of Ingleside for one year, and lived most of her life in El Salvador. Maria was a retired Aircraft Technician employed by American Airlines. She was a loving mother, sister, daughter and aunt who will be missed by all who knew her. Maria believed in the word of God and was baptized in the Jordan River. Throughout her life, she had a strong desire to share God’s word through countless bible studies. Maria was a true missionary on fire for the Lord. Preceding in death is a son: Carlos Diaz; a grandson: Ronald Diaz, Jr.; and a brother: Jose Francisco Diaz. Survivors include her sons: Ronald Diaz (Roxana) of San Antonio, Texas and Francisco Diaz (Yesenia) of Ingleside, Texas; daughters: Julie Aranda (Manuel) of Ridgecrest, CA and Lilian Smith (Jeff) of San Pedro, CA; 9 grandchildren: Daniel Diaz, Lilian Diaz, Jessica Kieley, Diane Diaz, Roxy Diaz, Alicia Diaz, Erick Aranda, David Aranda and Carlos Diaz. Visitation will begin Monday, April 1, 2019 from 6:00 PM to 9:00 PM at Resthaven Funeral Home Chapel, Aransas Pass. The funeral service will be held Tuesday, April 2, 2019, 11:00 AM at the funeral home with Pastor Andy Esqueche officiating. Burial will follow in San Ignacio Cemetery in Ingleside, Texas. Arrangements and care entrusted to Resthaven Funeral Home, Aransas Pass, Texas.